The traditional All In Recovery (See USK article, "All-In Recovery") takes some time and a good deal of orchestration and manipulation to complete, which leaves the 2nd paddler in the water for a longer exposure time. Since one of your goals for a capsize recovery should be to minimize your exposure to the elements, here is a variation for getting two or more swimmers back in their kayaks quickly. Having pumps is a necessity for this variation. Before I continue, I must admit that my first recommendation for any "All In" situation is every paddler does their quickest solo recovery. Once you are back in your kayak, with you and your boat sea worthy, then you can go help someone else. The "All In" recovery techniques are only good if solo recoveries cannot be performed. Then you need to depend on each other for a recovery. The swim time alone to get the kayaks near each other has more exposure time than I would like, but if solo options are out then swimming kayaks to each other is what needs to be done. It may be a good idea to review the Eskimo Bow Recovery and the Eskimo Paddle Recovery before you continue if you are not familiar with the techniques. See the USK Library Page "Capsize Recoveries" for these and other techniques. The idea of this "All In" variation is to do a wet re-entry and use you partners kayak (whether upright or overturned) for support to right yourself. When you come up you will have water in the cockpits, but the exposure time is relatively short when using this variation. A note of caution, be careful of banging kayaks when the seas are challenging. Helmets would be an excellent addition in rough conditions. As in any All-In Recovery, the paddlers in the water need to move their kayaks next to each other. Since most of us paddle some distance from our partners during an outing, the exposure time is increased just during the process of moving the kayaks together. Once the kayaks are together, you and your partner need to decide if you will do this simultaneously or one at a time. In this example we will show the technique with one paddler completing the skill before the other one begins. When the kayaks are together and parallel, with the kayaks in the bow to stern position, you and partner decide who will re-enter first. The 2nd paddler keeps the kayaks together. They can also hold both of the paddles. Deck lines provide a good hand hold for keeping kayaks together. You will need to release the deck line as your partner rolls up, but at that point they are holding the kayaks together. You can grip another line when your partner is upright. While paddler number two keeps the kayaks together, the first paddler performs a wet re-entry into their kayak. Remember to get yourself completely into your kayak with your feet on the foot pegs, thighs under the braces and your backside onto your seat. When ready, reach for the overturned bow of your partner's kayak and use it as a support to right yourself. You will use less energy if you have your head come up last by using your knees and hips to right your kayak first and let your body follow. One of the values of having proper floatation in a kayak is the support it can provide. Without good floatation, the end of the kayak would sink when weight were placed on it. Proper floatation gives you and your partner options. Improper floatation not only limits your options it can lead to serious consequences such as losing your kayak. When the first paddler is upright, they will have a cockpit partially filled with water. 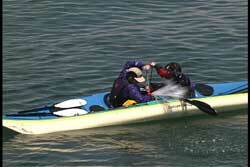 Even though this can cause some instability the second kayak provides the support necessary to stay upright. Since minimizing exposure time is essential, it is more important to get the second paddler out of the water before pumping out the water. As you will see later, pumping is better off done at the end of the entire sequence. After the paddles are transferred to the first paddler, who is now upright and holding the other kayak, the second paddler can begin their wet re-entry. When they are seated properly in their cockpit (upside-down) they reach for the upright bow of their partner's kayak. Again, be careful in rough seas. The second paddler rights his or her self, using efficient righting techniques. Grabbing the bow is only one of a few variations. The second paddler could have kept their paddle and once in their kayak use the paddle as a bridge between the kayaks and roll upright. The first paddler could have used the Eskimo Paddle Recovery for the second paddler as another variation. If the second paddler didn't want to do a wet re-entry the first paddler could perform a standard T-Recovery or any number of assisted recoveries. See the USK Library Page "Capsize Recoveries" for these and other techniques. When the second paddler is upright, they can get their paddles back while each maintains an upright position (remember there is water in their cockpits) by getting support from each other's kayak. Using paddle bridges across both boats gives great support. To get the water out of their kayaks, the two paddlers need to rest on each other's kayak and pump out the other's cockpit. By edging the kayaks toward each other the water pools toward the inside where it is very easy to pump the water. Resting on each other's kayak allows both to pump at the same time while getting support. When done both kayakers can be on their way. I mentioned earlier a pump was needed to do this recovery technique. While a pump will make it easier, there is still a way to empty the water after the dual wet re-entry. Have you figured out how to do it? I am not talking about a bailing bucket or a sponge. Has a method come to you yet? There is a way to get the water out of both kayaks, but it will take some work. See USK "Skill of the Month", April 2002 for a possible solution. I also mentioned that both swimmers could do their wet re-entry and Eskimo Recovery simultaneously. They would each keep their paddles between the kayaks and retrieve them when upright. It takes some practice to do it at the same time, but it does work. The key is to support yourself on your partner's kayak while allowing the kayak to roll under your hands. This can also be done simultaneously, if both paddlers used a paddle bridge to roll up as done in the Eskimo Paddle Recovery. Since the kayaks are rolling under the paddles, there would be little resistance from the other paddler. If your partner were to let go of your kayak during your wet re-entry phase what would you do? Would you wet exit and try again? Remember, you want to minimize overall exposure time and starting again will take longer. There are a few possibilities that come to mind for me. What comes to your mind? See USK "Skill of the Month", April 2002 for your answer. As you can see there are a number of ways to get the job done. The Dual Wet Re-entry and Eskimo Recovery is a wonderful variation to the traditional All-In Recovery. As always, I recommend you use nose clips* when performing any wet re-entry. It not only increases most paddlers breath holding capacity, it also reduces the chance of infection due to contaminated water in your nose and sinuses. *User friendly "Tweaker" nose clips are now available at the USK Store.